Exclusively Ours! 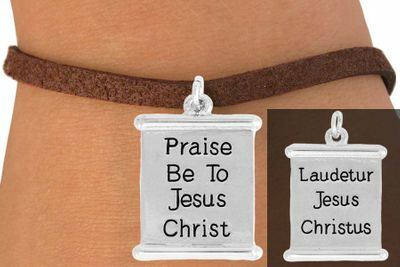 Lead & Nickel Free 2 Sided "Praise Be To Jesus Christ" On One Side, And On The Other In Latin It Says, "Laudetur Jesus Christus". This Scroll Charm Comes On A Bracelet Of Your Choice: Lobster Clasp Chain, Toggle Chain, Brown Suede Leatherette, Or Black Suede Leatherette.